The Market for Freeze Dried Food and Long Term Food Storage has increased in large scale during the last years. One of the companies that have expanded the most is Shelf Reliance, the blog sponsor Provisions America, LLC is an independent consultant working for this company. When I first tested the ShelfReliance Six Grain Pancake Mix I was a little skeptical; I followed the directions on the Can and the consistency of the mix was quite dense. The First Pancake was a disaster. After adding some more water to get a smoother pancake mix the pancakes came up just fine. It took a little adjustment but the end result was very good and the taste of the pancakes just fine. All cans come with white plastic lids that can be used to reseal a can after you opened it. An unopened can has a shelf life of ten years, but after you open a can the content should be used within a year. Inside the cans there is a small oxygen absorber that should be removed after opening the can. • Easy to use format with #10 Cans and plastic lids for every can so they can be sealed after use. #10 metal cans also provide resistance against Bugs, Rats and other potential hazards. One #10 Can costs 10.29 dollars, A case of Six #10 Cans cost 58.29 dollars. 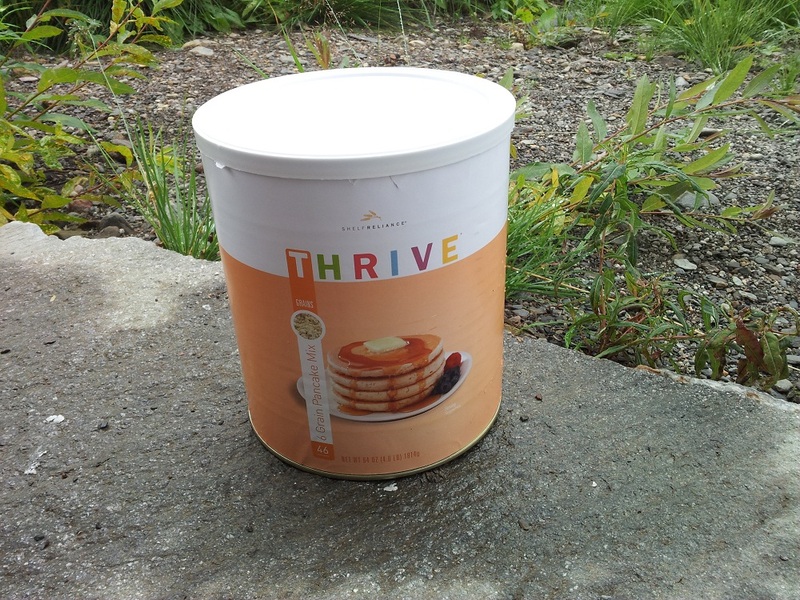 A Can contains 1,814kg of Pancake mix that make 46 servings of 140 calories each for 6640 calories in total. The main advantage with dehydrate and frieze dried products is that they have a long to very long shelf life, you often just have to add water when cooking making it a practical alternative for emergencies when you just might have a camping stove for preparing food. Shelf Reliance has expended their inventory so that they can provide everything from Grains to Vegetables, Fruits, Meats and Vegetables, Complete Entrees, Deserts and basic staples like salt, sugar and baking soda. For all Food Storage Eating What You Store and Storing What You Eat is critical. Do not start to purchase food that you don’t like or normally don’t eat. Find product that you like and products that you want to be a part of your everyday diet. hey thank you so much for sharing this great review with us. You have done a fantastic job here and I would encourage you to keep it up.